The boisterous tenor aria from La Traviata, arranged by Robert Elkjer. As recorded on the upcoming Alessi CD "Return to Sorrento". 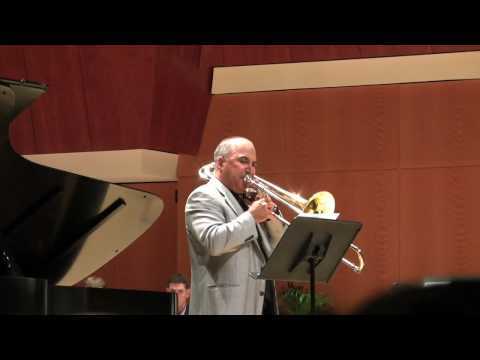 This mercurial piano recital piece is set for trombone and piano by Robert Elkjer. Bring your high range. A full, clear moon is captured with this most well-known Debussy piano piece, set for trombone and piano. 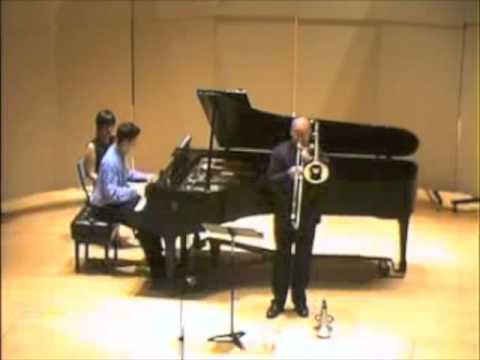 A beautiful rendition of Claude Debussy's famous work, for trombone duet and piano. One of a kind! Mr. Ferro sucessfully portraits certain periods of the day. He vividly captures Dawn (Daybreak) and sets the music so that we can picture the sun just starting to come up in the morning. Picture birds chirping, and very little sound. The piece progresses towards the sun gaining strength and height for the corona and finally the alba. I great piece for your recital combined with his other composition "Sunset"
In this work, composer Nicola Ferro has created a heartfelt solo for Bass Trombone, written for Martin Schippers of the Royal Concertgebouw Orchestra. Composition by Anthony Lavelle Barfield written for Joseph Alessi. Meditations was premiered at the 2007 Alessi seminar at the University of New Mexico. In this work, Mr. Barfield captures the minds journey during its meditative state. Meditations of Sound and Light is in three movements. I. Sound, II. Air, III. Light. Another beautiful arrangment as part of Mr. Ferro's great project "Tetralogy of the Sun" This includes, Daybreak, Midday, Sunset, and Midnight. Mr. Ferro sucessfully portraits certain periods of the day and night. Alessi Publications is proud to present this fantastic composer to all trombonists.